My 2cd attempt at this little fun shopmade “center line marking gauge” started with a rare find down in the shop recently (Some SPARE TIME :) And along with some motivation from a fellow LJer who’s kind actions resulted in a prototype exchange of sorts, which in return prompted this 2cd generation marking tool adventure! So to begin with and for those who might not know, this is a marking tool that allows You to locate the center of any boards edge without measuring nor calculating to do so. You simply reference the tools posts against the boards opposing faces and slide with light pressure, scribing a perfect Center line, that quick and that simple! I don’t have machining experience nor the equipment to simplify this build,just a basic woodworking DP. So I knew the hardest part of this build was going to be accuracy and achieving it ! Getting the reference posts and centering the scribe to within acceptable tolerances of each other took some effort. but by fabricating the set screw point by eye/hand , I assumed that most likely it would be off set fractionally and this in return would allow me to dial in accuracy by indexing the set screw until dead center was obtained (my theory anyways)! So I am happy to report that with some tweaking I got it to a point of acceptable accuracy and am very pleased with the overall outcome ! 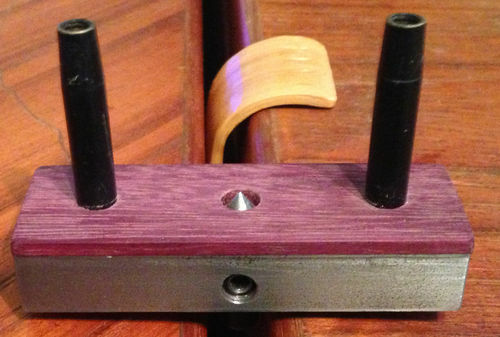 To Finish it up I fashioned some spare Bloodwood into a grip and attached with CA glue. All that was left to do was to apply a light coating of oil, sit back and marvel at its simplistic design and function!! Not one of them tools that you will find yourself using everyday but when called upon, it sure makes the task easier and I am all for that!..........Thanks for taking the time to look and as always,any questions welcomed. Stay safe! Verry inovative and pretty nice tool. that is brilliant. This is definitely going on the list of must haves. Thank you very much for sharing. I have the prototype thanks to Rob’s generosity. I absolutely love it. First time I opened the package, I didn’t have the faintest idea of what I was looking at, but once he explained it to me, I was really impressed. Thanks Rob, I am using this already. I’ve been wanting to build one of these since I’ve discovered them. Could you explain again how the set screw allows you to fine-tune the tool’s calibration? Getting the mark dead center to the posts has been my biggest query regarding its design. Great center marker. I’ve made several for use on guitar necks and bows. They really are handy and your adjustable model is great! This is a clever design. I’ll have to build one myself soon. Are those bars just threaded standoffs? place on pin (so piece can be rotated 180°), then drill one end, rotate to other end, drill and Bob’s your Uncle! Really do like your eccentric center pin though. Did you mention where you got the metal parts of this tool? also, where did you get the plywood in your pictures? It looks so pretty! Nice! ... and whitewulf’s suggestion is a great simplification.